New York, Nov 5 (IANS) US Secretary of State Mike Pompeo announced on Monday that Washington was exempting India from the sanctions on importing oil from Iran. 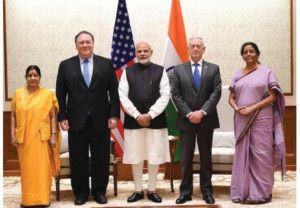 He said the US will continue to negotiate with India and the seven other countries receiving the six-month exemption to get them to cut their Iranian imports to zero. The other countries receiving the exemptions Pompeo announced at a news conference with foreign correspondents in Washington were China, Greece, Italy, Turkey, South Korea, Taiwan and Japan. Treasury Secretary Steve Mnuchin said that his department was imposing sanctions on 700 individuals, entities, aircraft and ships. In July, US President Donald Trump announced he was pulling out of the nuclear deal signed in 2015 by the five permanent members of the United Nations Security Council, Germany and the European Union with Iran to end its nuclear weapons programme. Trump said the sanctions that had been lifted after the agreement would be reimposed and the oil trade would be targeted starting Monday. Pompeo said that an important reason for the reimposition of the sanctions was Iran’s promotion of terrorism and that it was aimed at curbing its “revolutionary” policies. Pompeo said the payments made by the oil importers under the exemptions would be put in a special account from which Iran could only make payments for purchases for humanitarian programmes. India imported from Iran nearly 10 per cent of the total of 220 million metric tonnes of crude oil it imported during 2017-18. Since the reimposition of sanctions were announced, India has been cutting back on the Iranian imports.